Temperature transmitters are widely used in modern instrumentation systems because they allow long cable runs to be used in the instrumentation and control system. They also perform some signal conditioning function. As shown in the schematic above, a two wire temperature transmitter accepts a thermocouple or three wire Pt100 input and converts the ''temperature'' output into a 4-20mA current signal. 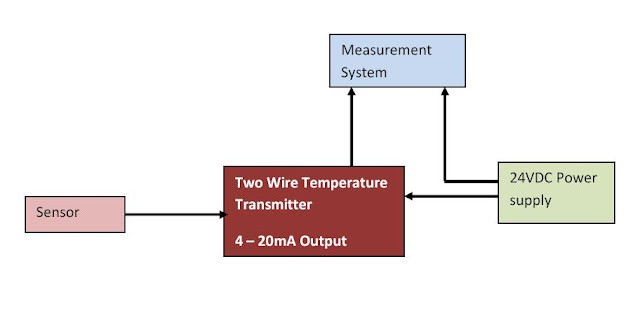 The transmitter usually requires a 24VDC supply which is connected in series with the two wire interface or provided by the host instrument. The amplified temperature signal can be transmitted via a long cable run if required. This is a key advantage especially when dealing with large site installations. What about the signal conditioning function of the transmitter? This is the process of modifying the raw input signal in one or more ways to facilitate communication and measurement. The transmitter is a simple form of signal conditioner but signal conditioners usually provide linearization scaling facilities and other functions. Signal conditioners are particularly useful when different parameters are measured in a process (e.g. Pt100 and thermocouple outputs, flow rates, pressure and force). The output from all of the appropriate sensors or transducers can then be rationalised into a common interface such as 4-20mA or 1-5V. Owing to advancement in technology, most transmitters are becoming intelligent end devices largely because they are micro-processor based. Most of these devices are now regarded as “smart”devices that can be programmed to achieve a desired result in the plant. These programmable and so called “smart” transmitters effectively combine transmission and signal conditioning functions. In addition to manipulating the input-output function, a variety of transmission modes can be selected. Isolation of input to output further enhances their scope of applications; for example a multi-sensor installation with individual transmitters can be used without danger of earth loops establishing spurious potentials. Programming is performed via a PC using software normally supplied or via a plug-in module.